Meet: Sunday 20 September 2009 at 2.30 pm at Chiswick Park, Building 3, 566 Chiswick High Road W4 5YA. Starting at the RIBA award-winning ‘Chiswick Park’ (Richard Rogers Partnership 2000) and finishing in the Mill Hill Park Conservation Area, home of William Willett (1856 – 1915), its principal builder and originator of Daylight Saving Time. 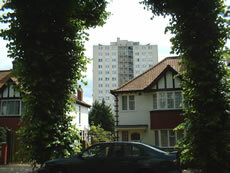 The walk takes in the industrial and residential landscape of South Acton, with high rise towers and slab blocks illustrating a variety of twentieth century social housing styles. It passes another London Open House weekend offer - the Llowarch designed South Acton Children’s Centre.